October 5th 2015. Lack of information on Happy Harold's progress has been noted. There has been little to report but that does not mean that nothing has been happening. Preparatory work is under way to make sure that the work can be done to a very high standard and finding parts for a sixty-year-old engine of an unusual design is not easy. New, replacement and reconditioned parts are being assembled and a custom-made jig to hold the engine while it's being worked on is nearing completion. 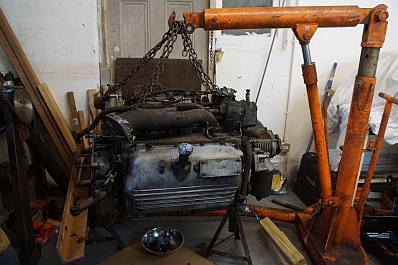 The engine has been moved to a new workshop and should be in its cradle very shortly. In the meantime here's a couple of pix of the power unit ready to be fitted to the jig that will enable it to be rotated and worked on. 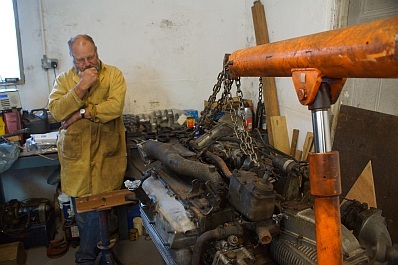 Tom Bewick, one of the few people in the UK familiar with this engine, contemplates the size of the problem and the task ahead of him.